1 Total population includes foreign residents. Maltese residents population estimate at end 2004 was 389,769. All official population data provided by the NSO . 2also .eu, shared with other European Union member states. Malta, officially the Republic of Malta, (also Malta GC) is a small and densely populated island nation consisting of an archipelago of seven islands in the middle of the Mediterranean Sea. 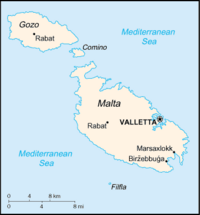 Malta lies directly south of Sicily, east of Tunisia and north of Libya. The country's official languages are Maltese and English. Roman Catholicism is the most practised religion. 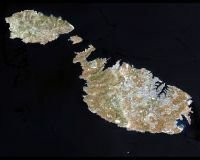 The strategically located islands constituting the Maltese nation have been ruled by various powers and fought over for centuries. Malta has been a member state of the European Union since May 1, 2004, and it is currently the smallest EU country in both population and area. Malta is the only nation in the world that has collectively been awarded the George Cross for conspicuous gallantry, and its flag bears a replica of that award. Ħaġar Qim Temples, Qrendi, Malta. The islands later came under the control of Carthage ( 400 BC) and then of Rome ( 218 BC). The islands prospered under Roman rule, during which time they were considered a Municipium and a Foederata Civitas. Many Roman antiquities still exist, testifying to the close link between the Maltese inhabitants and the people of Rome. In AD 60, the islands were visited by Saint Paul, who is said to have been shipwrecked on the shores of the aptly-named " Saint Paul's Bay". After a period of Byzantine rule (4th to 9th century) and a probable sack by the Vandals, the islands were conquered by the Arabs in AD 870. The Arabs, who generally tolerated the population's Christianity, introduced the cultivation of citrus fruits and cotton, and irrigation systems. Arab influence can be seen most prominently in the modern Maltese language, which also contains significant Romance influences, and is written in a variety of the Latin alphabet. In 1530, the islands were given by Spain to the Order of Knights of the Hospital of St John of Jerusalem in perpetual lease. (The Kingdom of Aragon had owned the islands as part of their Mediterranean empire for some time). These knights, a military religious order now known as the " Knights of Malta", had been driven out of Rhodes by the Ottoman Empire in 1522. They withstood a full-blown siege by the Ottoman Turks in 1565. The Turks, at that time, were considered to be a great power. After this they decided to increase the fortifications, particularly in the inner-harbour area, where the new city of Valletta, named after Jean Parisot de la Valette, was built. Their reign ended when Malta was captured by Napoleon en route to his expedition of Egypt during the French Revolutionary Wars in 1798. As a ruse, Napoleon asked for safe harbour to resupply his ships, and then turned his guns against his hosts once safely inside Valletta. The Grandmaster, knew that he could only allow a few ships at a time to enter the harbour, due to the Treaty of Trent. Grand Master Ferdinand von Hompesch zu Bolheim capitulated, and Napoleon stayed in Malta for a few days, during which he systematically looted the movable assets of the Order, and established an administration controlled by his nominees. He then sailed for Egypt, leaving a substantial garrison in Malta. The occupying French forces were unpopular, however, due particularly to their negative attitude towards religion. The financial reforms and the religious reforms did not go down well with the citizens. Furthermore, the French were arrogant and snobbish in their attitude towards the Maltese. The Maltese rebelled against them, and the French were forced behind the fortifications. Great Britain, along with the Kingdom of the Two Sicilies, sent munitions and aid to the rebels. Britain also sent her navy, which instigated a blockade of the islands. The isolated French forces, under General Claude-Henri Belgrand de Vaubois, surrendered in 1800, and the island became a British protectorate, being presented by several Maltese leaders to Sir Alexander Ball. Fortifications of the Grand Harbour, Valletta. In 1814, as part of the Treaty of Paris, Malta officially became a part of the British Empire, and was used as a shipping way-station and fleet headquarters. Malta's position half-way between Gibraltar and the Suez Canal proved to be its main asset during these years, and it was considered to be a most important stop on the way to India. In the 1930s, due to Malta's cultural and geographical proximity to Italy, the British Mediterranean Fleet was moved to Alexandria. Malta played an important role during World War II, owing to its vicinity to Axis shipping lanes. The bravery of the Maltese people in their long struggle against enemy attack moved H.M. King George VI to award the George Cross to Malta on a collective basis on 15 April 1942, "to bear witness to a heroism and devotion that will long be famous in history". A replica of the George Cross now appears in the upper hoist corner of the Flag of Malta, outlined in red. After the war, and after a short period of political instability due to the Malta Labour Party's unsuccessful attempt at 'Integration with Britain', Malta was granted independence on September 21, 1964 ( Independence Day). Under its 1964 constitution, Malta initially retained Queen Elizabeth II as Queen of Malta, with a Governor-General exercising executive authority on her behalf. On December 13, 1974 ( Republic Day), however, it became a republic within the Commonwealth, with the President as head of state. A defence agreement signed soon after independence (and re-negotiated in 1972) expired on March 31, 1979 ( Freedom Day) when the British military forces were withdrawn. Malta joined the European Union on May 1, 2004. It intends to join the Eurozone in 2008. 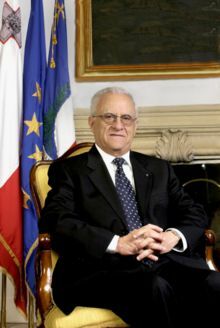 Dr. Edward Fenech Adami has been the President of Malta since 2004. Malta is a republic, whose parliamentary system and public administration is closely modelled on the Westminster system. The unicameral House of Representatives, known in Maltese as "Il-Kamra tar-Rappreżentanti", is elected by direct universal suffrage through single transferable vote every five years, unless the House is dissolved earlier by the President on advice of the Prime Minister. The House of Representatives is made up of 65 Members of Parliament. However, where a party wins an absolute majority of votes, but does not have a majority of seats, that party is given additional seats to ensure a parliamentary majority. The Constitution of Malta provides that the President appoint as Prime Minister the member of the House who is best able to command a (governing) majority in the House. Imperium Europa, which promotes White Nationalism and Libertarianism. Alpha Liberal Democratic Party, which is a liberal reformist party. Malta is an archipelago in the central Mediterranean Sea, some 93 km south of Sicily. Only the three largest islands Malta Island (Malta), Gozo (Għawdex), and Comino (Kemmuna) are inhabited. The smaller islands, such as Filfla, Cominotto and the Islands of St. Paul are uninhabited. Numerous bays along the indented coastline of the islands provide good harbours. The landscape is characterised by low hills with terraced fields. The highest point is at Ta' Dmejrek on Malta Island at 253 metres (830 ft) near Dingli. Although there are some small rivers at times of high rainfall, there are no permanent rivers or lakes on Malta. Contrary to popular belief, the south of Malta is not Europe's most southern point, that being the Greek island of Gavdos. 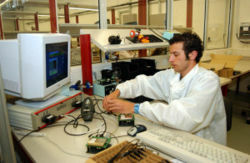 A Maltese worker producing system components for wireless communication. Some Maltese at a local fish market. The Maltese people are descended from mixed French, Italian, English, Arab, Spanish, and Greek peoples. The resident population of Malta, which includes foreigners residing in Malta for at least a year, as at 27 November 2005 was estimated at 404,039 of whom 200,715 (49.7%) were males and 203,324 (50.3%) were females. Of these, 17.1 per cent were aged 14 and under, 68.2 per cent were within the 15–64 age bracket whilst the remaining 13.7 per cent were 65 years and over. Malta's population density of 1,282 per square kilometre (3,322/ sq mi) is by far the highest in the EU, and one of the highest in the world. The only census year showing a fall in population was that of 1967, with a 1.7% total decrease, attributable to a substantial number of Maltese residents who emigrated. The Maltese-resident population for 2004 was estimated to make up 97.0% of the total resident population. Figures for 2005 are still unavailable. Through all the censuses since 1842 there was always a slightly higher female-to-male ratio. Closest to reaching equality were 1901 and 1911 censuses. The highest female-to-male ratio was reached in 1957 (1088:1000), and since the ratio has been constantly dropping. The 2005 census showed a 1013:1000 female-to-male ratio. Population growth has slowed down, from +9.5% between the 1985 and 1995 censuses, to +6.9% between the 1995 and 2005 censuses (a yearly average of +0.7%). The birth rate stood at 3860 (a decrease of 21.8% from the 1995 census) and the death rate stood at 3025. Thus, there was a natural population increase of 835 (compared to +888 for 2004, of which over a hundred were foreign residents). The national language of Malta is Maltese. The Maltese alphabet is based on the Latin alphabet, but uses the diacritically altered letters ż, also found in Polish, as well as the letters ċ, ġ and ħ, which are unique to Maltese. The official languages are English and Maltese. Italian, French and German are also widely spoken and taught in secondary schools, though the latter two less so. Roman Catholicism is the religion of approximately 98% of the population (CIA World Factbook, 2006). See Roman Catholicism in Malta. 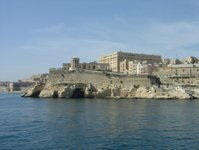 Maltese laws for immigration generally follow EU legislation. Therefore EU nationals require neither a visa nor a passport (an ID card or an expired passport are enough) to enter the country. Citizens of a number of other countries are also not required to apply for a visa and require only a valid passport when residing in Malta for up to three months. Visas for other nationalities are valid for one month. Immigrants are required to apply for a work permit. This exception to EU law was agreed upon before accession to safeguard the Maltese labour market, the growth of which is reaching saturation . In practice though, all work permits to EU nationals are granted, and currently this exercise is only used to monitor the labour market for any needed intervention. During 2005, a total of 1,800 immigrants reached Malta illegally. Given Malta's high population density, the impact of this figure on Malta is equivalent to that of an arrival of 369,000 illegal immigrants in Germany and other large EU member states. In the first half of 2006, 967 illegal immigrants arrived in Malta – almost double the 473 who arrived in the same period in 2005. The reason for such high numbers is due to the fact that Malta is the southernmost tip of the European Union and is therefore in the front line when dealing with the heavy northward migration of immigrants from Africa. Another factor contributing to the problem is Malta's approximately 250,000 square kilometres of open sea search and rescue region. Though Malta has historically been generous, just and humane in welcoming illegal immigrants, increase in violence has been spotted during the past years. In January 2005, asylum seekers detained the camp of Safi have been beaten by the soldiers of the Armed Forces of Malta. Another situation is the developping of anti-immigrant movements like Imperium Europa or ANR. Around 45 % of illegal immigrants landed in Malta have been granted refugee (5%) or protected humanitarian status (40%), which is the highest rate of acceptance in the EU. A White Paper suggesting the grant of Maltese citizenship to refugees resident in Malta for over ten years was issued in 2005. Historically Malta gave refuge (and assisted in their resettlement) to just about eight hundred East African Asians who had been expelled from Uganda by Idi Amin and to just under a thousand Iraqis fleeing from Saddam Hussein's regime. Presently the problem of illegal immigration has increased, with severe strains on Malta's health, employment and social services, its internal security and public order, its social fabric and on the labour market. Detention costs for the first half of 2006 alone cost Lm320,423 (€746,385). In 2005, Malta sought EU aid in relation to reception of illegal immigrants, repatriation of those denied refugee status, resettlement of refugees into EU countries, and maritime security. In December 2005, the European Council adopted The Global Approach to Migration: Priority Actions focusing on Africa and the Mediterranean; but the deployment of said actions has been limited to the western Mediterranean, thus putting further pressure on the central Mediterranean route for illegal immigration which Malta forms part of. Political tension started developing as the EU persistently ignored Malta's precarious situation: member states party to the legally-binding Cotonou Agreement continued not to fulfill their obligations and East African countries, from which most central Mediterranean illegal immigration originates, were excluded from the Euro-African Conference on Migration and Development held 10-11 July 2006 in Tripoli). Education is compulsory between the ages of 5 and 16 years. While the state provides education free of charge, the Church and the private sector run a number of schools in Malta and Gozo. Most of the teachers' salary in Church schools is paid by the state. Education in Malta is based on the British Model. Once compulsory secondary education ends, students may enter either in a vocational college such as MCAST or a Sixth Form. Sixth forms provide a two-year course leading to the "Matriculation Certificate", which is the equivalent of the UK Advanced Level Examinations and Advanced Subsidiary Examinations. For students unsuccessful in their SEC examinations, there is the option of attending a Higher Secondary school, a sort of safety net to give students the possibility to catch up, where any core subjects (mathematics, English language, Maltese, and a natural science) previously failed are again taught at ordinary level in preparation for SEC examinations, while also teaching intermediate and advanced level subjects. Students may also choose to attend specialised private institutions leading to diplomas and degrees of foreign examination bodies in careers such as IT ( London University), Networking ( CISCO), Accountancy ( ACCA) and Banking.